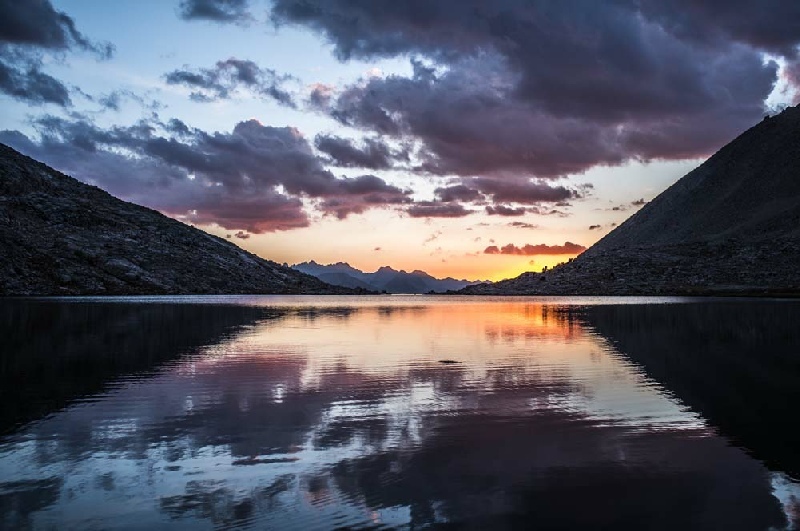 The John Muir Trail, named after the famous early environmentalist, runs along the spine of the Sierra Nevada range of mountains in northern California. 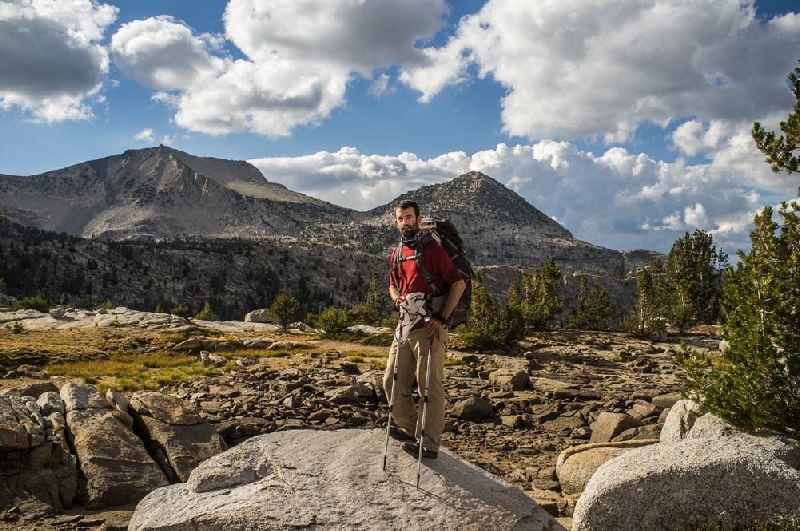 The route stretches 211 miles from the Happy Isles trailhead at Yosemite to the summit of Mount Whitney. 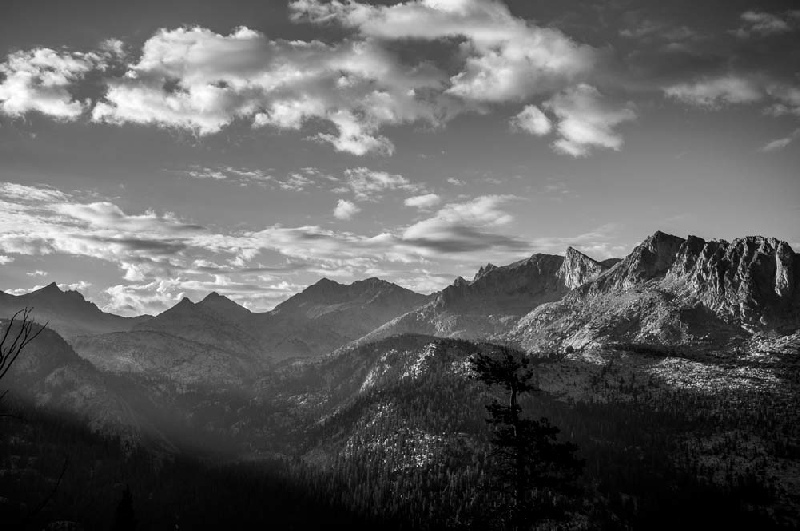 The beautiful Sierra Nevada were referred to as the "Range of Light" by John Muir, and contain an incredible diversity of scenery. This is many peoples' favourite hike anywhere in the world. The trek is of varying heights, taking between 2-3 weeks to hike the whole trail. 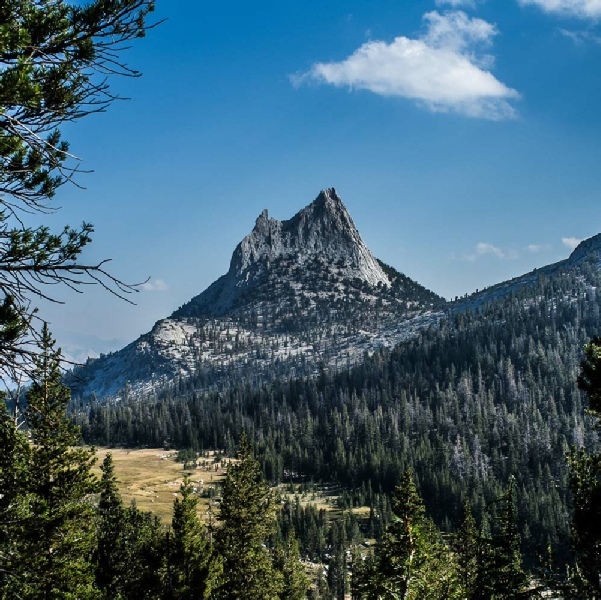 The route is not, however, especially difficult and winds it way through three national parks, one national monument (the Devil's Postpile) and two wilderness areas. 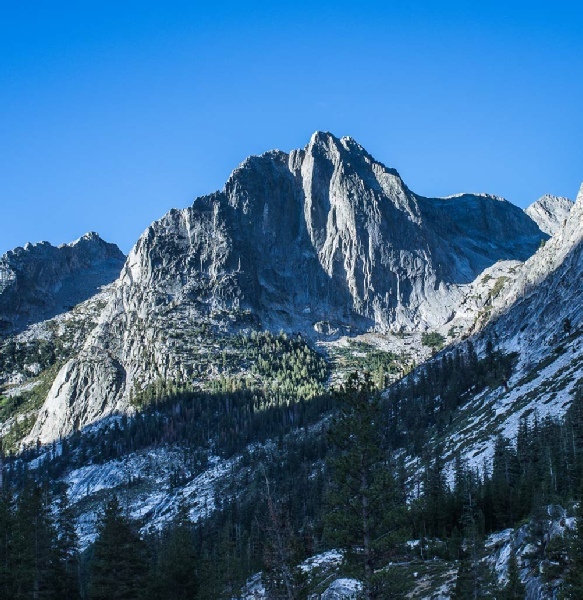 It is the home to many animals and birds including black bears, coyotes, wolverine, mule deer, bighorn sheep, marmots, red-tailed hawks, and great horned owls. 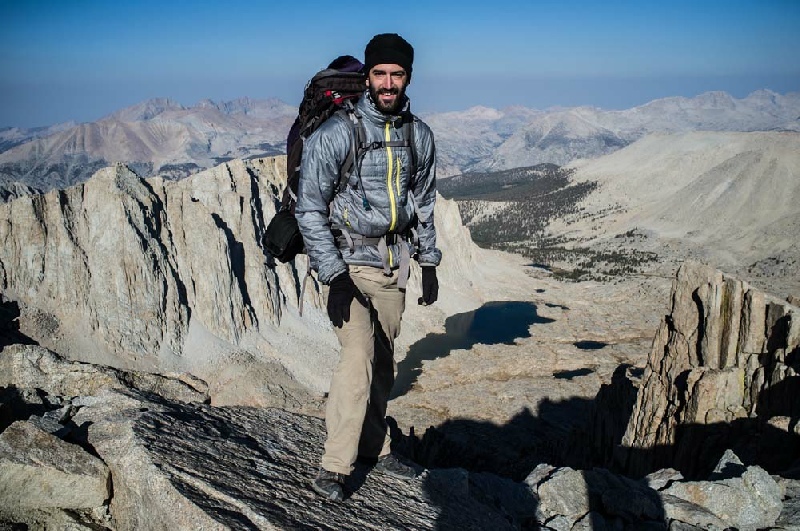 The trail reaches 4,421m at the top of Mount Whitney, and averages a shade over 3,000m. David did the trip in the company of Mike and we were joined from Red’s Meadow onwards by Vere and Fionn. Further pictures are here. 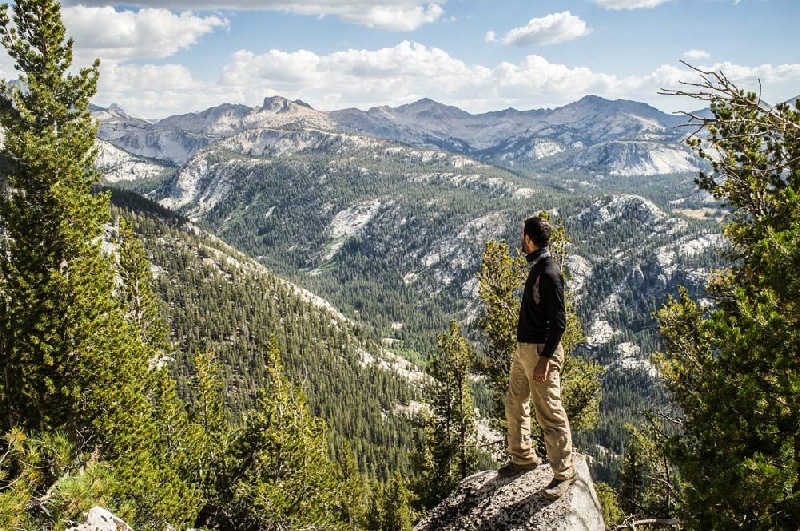 A DVD of the John Muir Trail is available. Apply for your permit 168 days before you plan to start the Trail and follow the Yosemite Park instructions to the letter - it took almost two weeks to finally get the permit for this trip so start early and do not expect to get lucky straight away. Allow a bit more room in your boots (1/2 a size) because it is hot and your feet swell a little bit. Keep the weight to an absolute minimum. The pack base weight for this trip was kept to about 25 pounds without food, water and fuel. We rented Expedition bear canisters from Wild Ideas. These are very roomy and light due to the construction from carbon fibre. 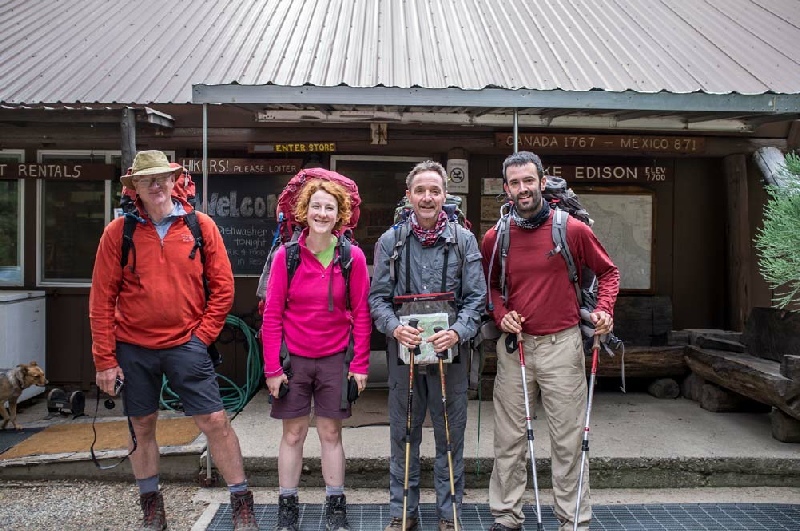 The guys at Wild Ideas also do a discounted rental rate for JMT walkers and are a great company to deal with. Highly recommended! It can get cold at night so a good lightweight 3 season down sleeping bag is a must. Go-Lite and Western Mountaineering bags are recommended though quite pricey. 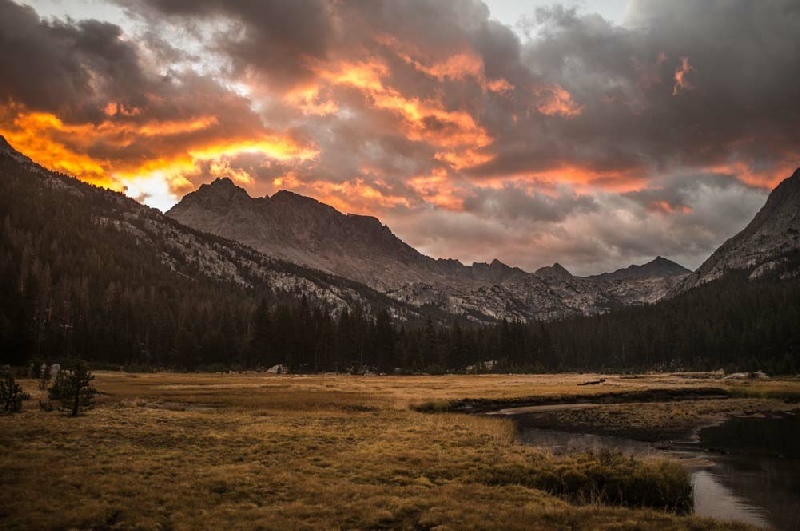 It does not generally rain in the summer season in the Sierras. To save weight, the flysheet of the tent was not taken on this trip. It did however rain heavily for a day on the trek so on balance I think I would definitely take the flysheet if I ever do it again. Having the flysheet also helps reduce condensation due to effect of the warm layer of air next to the inner tent. Get up and start early each day so as to give plenty of time for relaxing and recovering after each day. Enjoy the company you meet on the walk. The route marking is excellent - there is no problem with navigation. Take plenty digital memory for photographs. There are masses of websites that give a huge amount of information on how to get permits, what food to take and re-supply tactics. I have listed the ones I have used in the past to help with the preparation stage in the Useful Sites Section at the end of the trip description. After an enjoyable afternoon exploring the Yosemite valley floor, we had a good night's rest at the Backpackers Campsite. 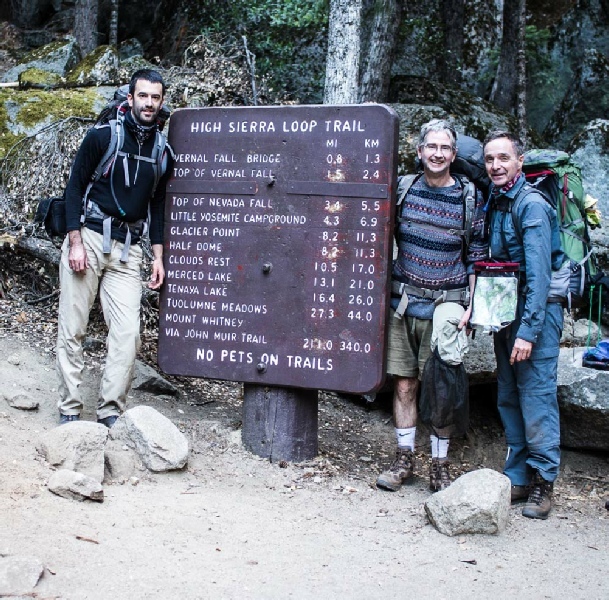 After an early start, Martin, Mike and myself set out on the road to the Trail Head. 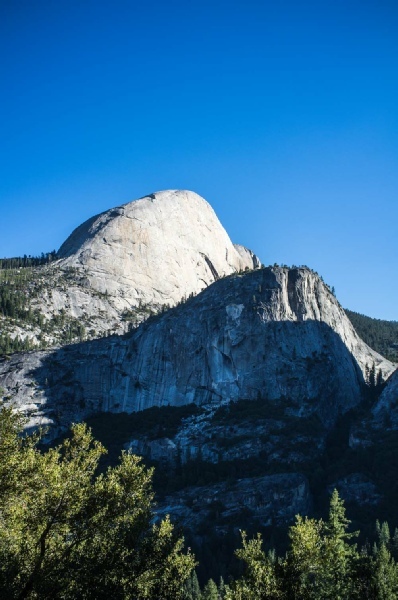 The sign at the beginning of the John Muir Trail was photographed and then it was "heads down" for the climb to the top of the Nevada Falls. The pack was considerably lighter than on my previous JMT trek and this helped enormously, easing the pain of the first ascent. After a couple of hours, it was very sad to hear Martin say he was having problems with one of his calf muscles and he had decided to go back to the valley floor. At the Half Dome junction we carried straight on towards Sunrise Creek. The series of switchbacks later on in the day seriously tested our reserves and it was after 6 in the evening before we made the Sunrise Sierra Camp and set up the tent. A long and tiring day. Getting into the rhythm of the trail is a bit of challenge for the first few days so it took us quite a while to get packed up and ready to start the day’s walking. The first part of the day involved the gentle climb up Cathedral Pass and then dropping down into Tuolumne Meadows. The Grill in the Tuolumne village does a brilliant bacon and cheese burger which helped the calorie intake enormously. A very pleasant afternoon was spent walking along the Lyell Fork River until the path started to climb which is where we camped for the night. An uneventful night was had with no bear issues. 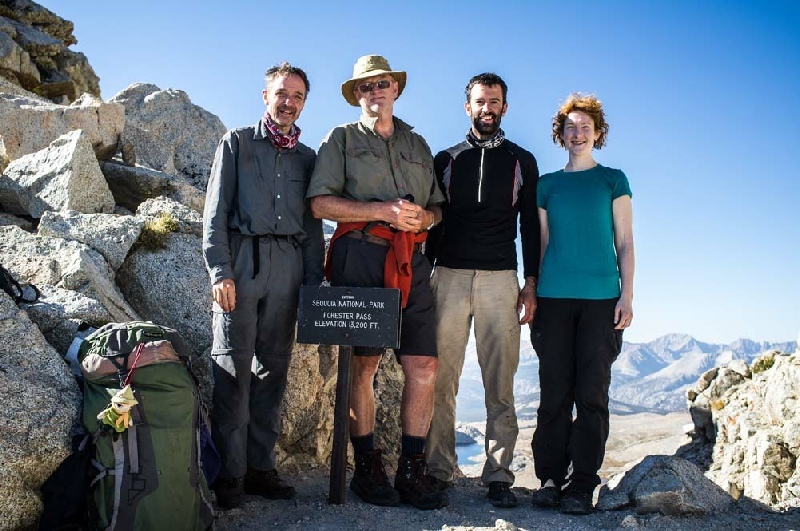 The initial part of the day included the ascent of the first serious mountain pass of the JMT, the Donohue Pass. The views from this pass were stunning and gave a window into the joys to come further along the trail. After a inconsequential second pass of the day, Island Pass, the wonderful Thousand Island Lake was passed. A ranger passed us at Ruby Lake and asked for the only inspection of our trail permit on the whole trail. She very kindly gave us some information on a good place to camp near Garnet Lake using a side trail just before the drop down to the Lake and camping near the top of the Lake, under the Ritter range of mountains. After making our way to the campsite, we then had our first swim of the trip in the cold but wonderful water of Garnet Lake. 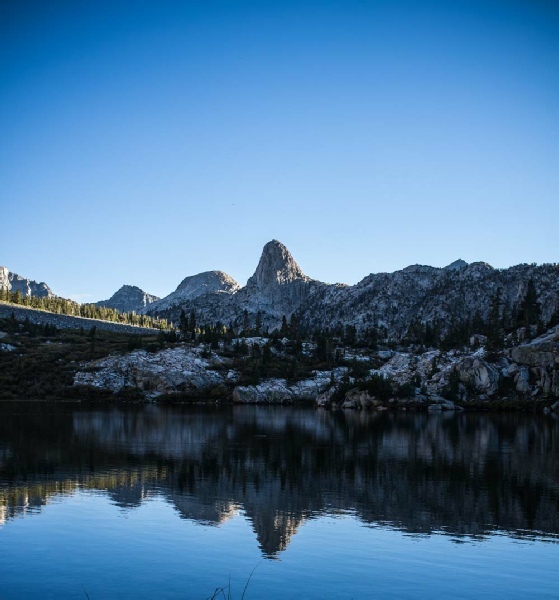 The day was a joy with the JMT threading it's way through some of the best mountain/lake country on the whole of the Trail. Garnett Lake in the early morning is flooded with wonderful light and amazing views of the surrounding mountains of the Ritter range. Shadow Lake was passed early in the morning with stunning reflections in the crystal clear water. Mike decided to check out the water in the lake with a swim as well. 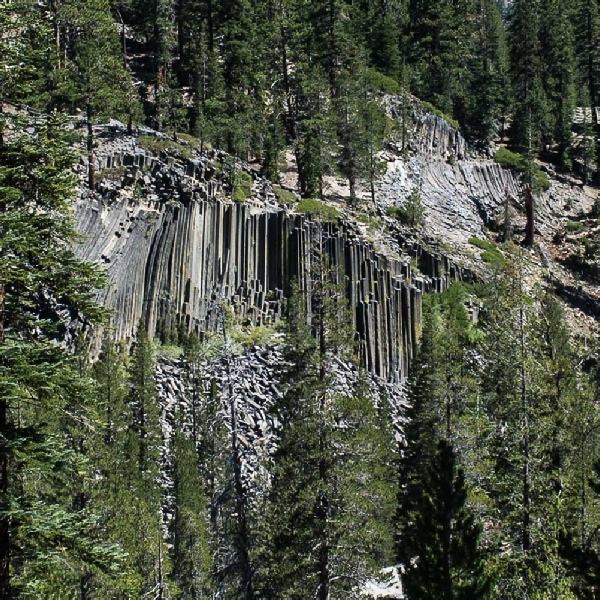 A fast long wooded descent saw us down to the Devils Postpile National Monument and a view of the basaltic column structures. Reds Meadow Resort was the next port of call with the very welcome showers and the excellent restaurant. After a good breakfast in the restaurant the climb towards Deer Creek was a bit of struggle with such a full stomach but the red pumice cones added interest to the climb. The rest of the day was easy with gently gradients and wide open views especially near the picturesque Purple Lake until the steep climb just beyond the Lake. The day ended by setting up the tent at Virginia lake and a great swim to follow. 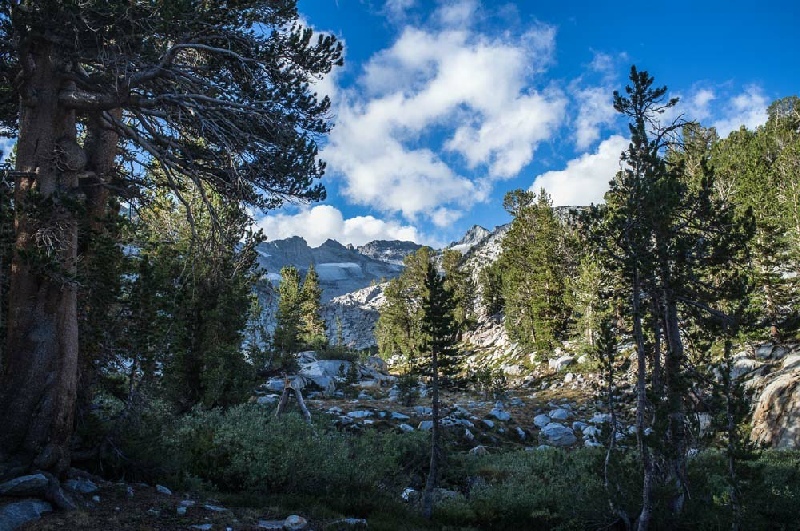 The rocky landscape around Virginia Lake was replaced by a lush woodland near Tully Hole. The next obstacle was Silver Pass which was climbed without too much pain amongst some very inspiring rock scenery. The long zig-zag descent lead to Pocket Meadow and the lunch stop. The Trail then lead gently down to Edison Lake and what would normally be the pickup point for the Vermillion Valley Resort ferry. However, we had been warned on the trail that the Lake was more or less empty and the ferry understandably was not running. When we got to the ferry pick-up point we could not quite believe what we saw with a vast and barren dessert stretching out in front of us with no water in sight. The weirdness of the scene was also exacerbated by the smoke that had blown in from the massive fire north of Yosemite. We decided to walk to the Resort directly across the floor of the lake and it was with much relief that we finally got to the resort about an hour and an half later. A day of chores with clothes being washed and the food supplies sorted out. 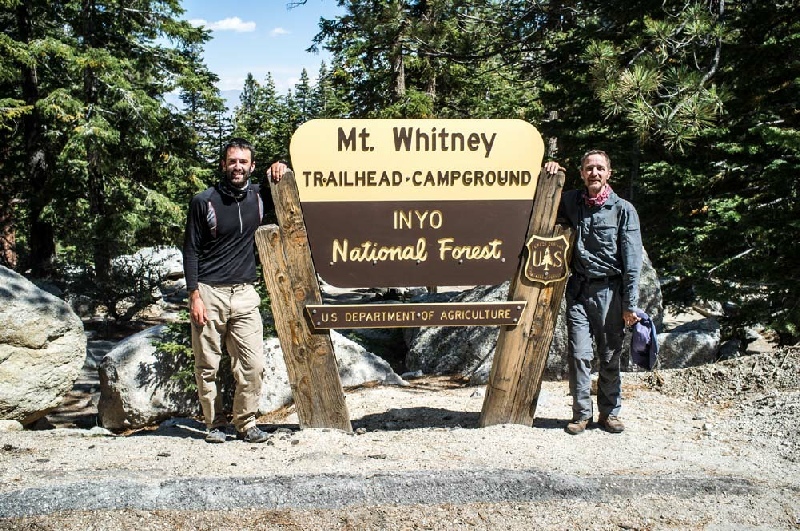 The logistics of the rest of trail were also discussed and great assurance from Vere that it would be no problem, it was decided that we would attempt to do the remaining trail to Mount Whitney in 8 days. 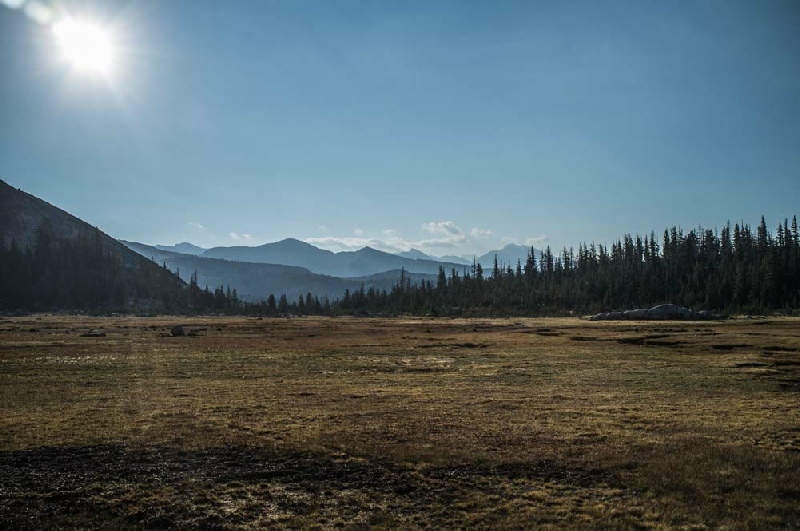 The thought of repeating the trudge across Eddison Lake floor filled all of us with dread so it was with great relief that we were offered a lift by John to the Bear Creek Trailhead in his very impressive pick-up truck. We then followed Bear Creek until after about 7 miles we finally joined the JMT again. We carried on following Bear Creek for many more miles to Upper Bear Creek Meadows and then west onto to Rosemarie Meadow. After this point, the ascent up the Selden Pass was very straightforward. The top of pass stands at 10,900 ft and the views of the northern section of the JMT were wonderful, stretching out as far as the eye could see. There followed a descent until we stopped to make camp at Heart Lake. The day started with rain and it continued to rain of and on all through the day. 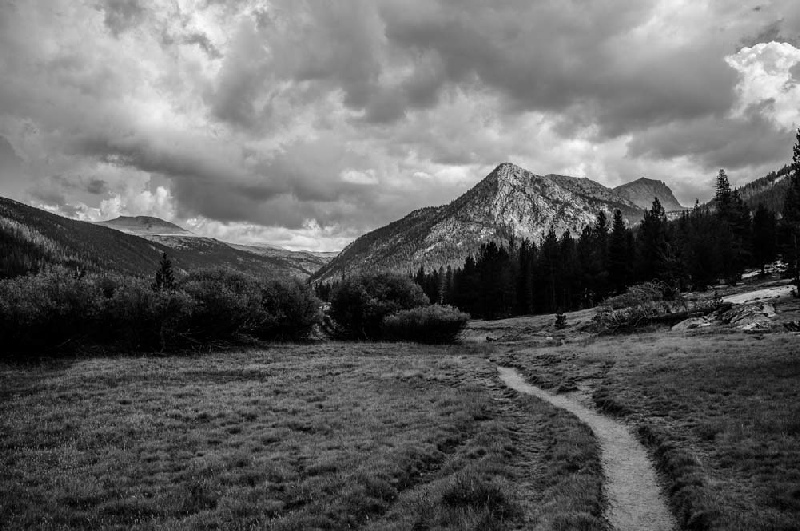 The Trail headed southwards along the very beautiful San Joaquin Valley to enter the Kings Canyon National Park. At Franklin Meadow, a major fork in the trail was reached and the substantial ascent into Evolution Valley brought us to the river crossing at Evolution Meadow. The path on the northern bank of the river then gradually climbed to the very lush McClure Meadow. The rain was very heavy as we set up our camp but fortunately it stopped at around 6 in the evening to allow wet tents and clothes to dry out before the next day. A very memorable evening was spent gazing up at the wonderful panorama of the cirque of mountains. Today's route ascended the Muir Pass. Standing at 11995ft, this was the highest point so far on the Trail. 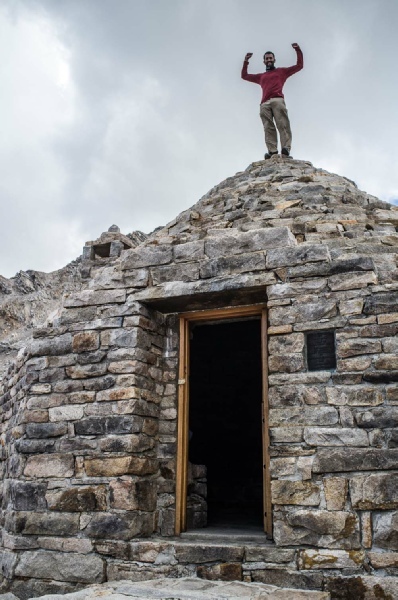 The high point on the pass is marked by a shelter built by the Sierra Club in 1930 for emergency use only. A series of wonderfully clear lakes were passed on the way to the top of the pass including Evolution, Sapphire and Wanda Lakes. The shelter was reached and pictures were taken of members of the party perched on the top of the shelter. 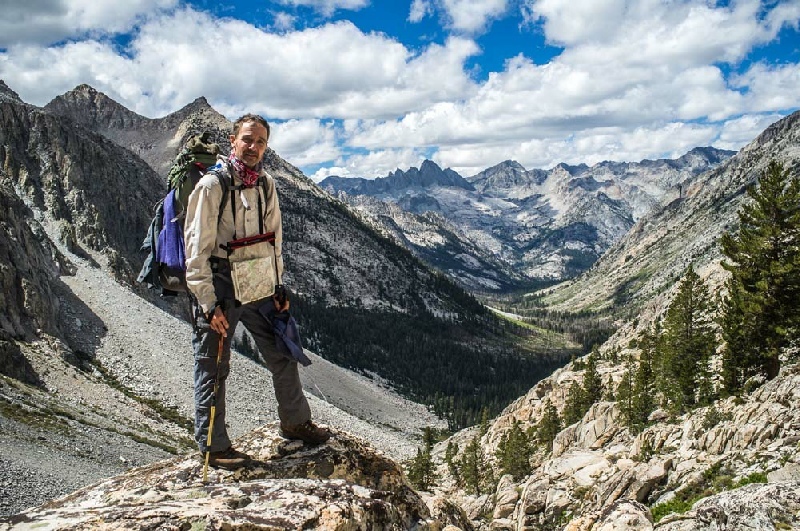 After the pass we entered the barren, impressive and fragile high mountain landscape of the southern JMT. 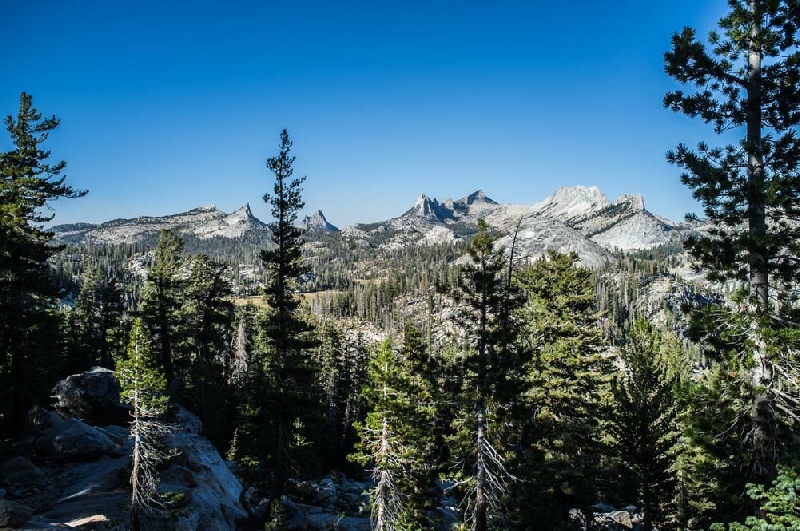 A steep descent lead to the tree-line and a good campsite in the alpine meadow and forest near the Le Conte Canyon Ranger station. The day started with the long and gentle descent down Le Conte Canyon. 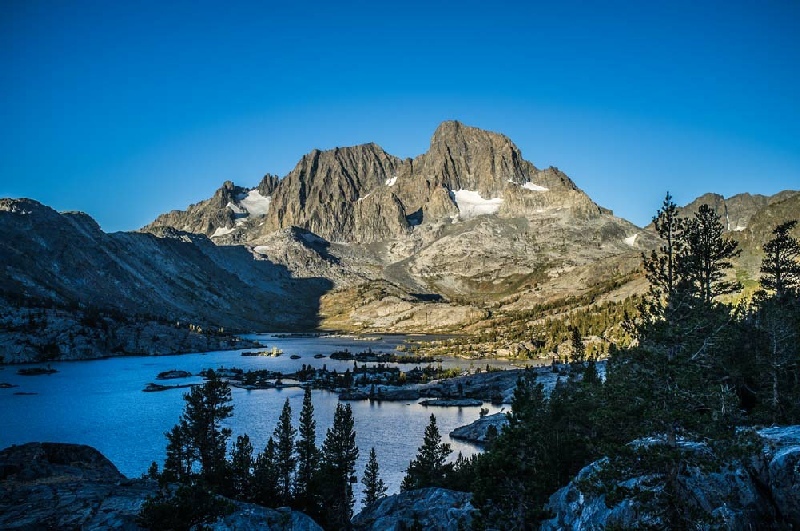 This area is a true high spot of the JMT with soaring granite cliffs stretching the length of the Canyon. 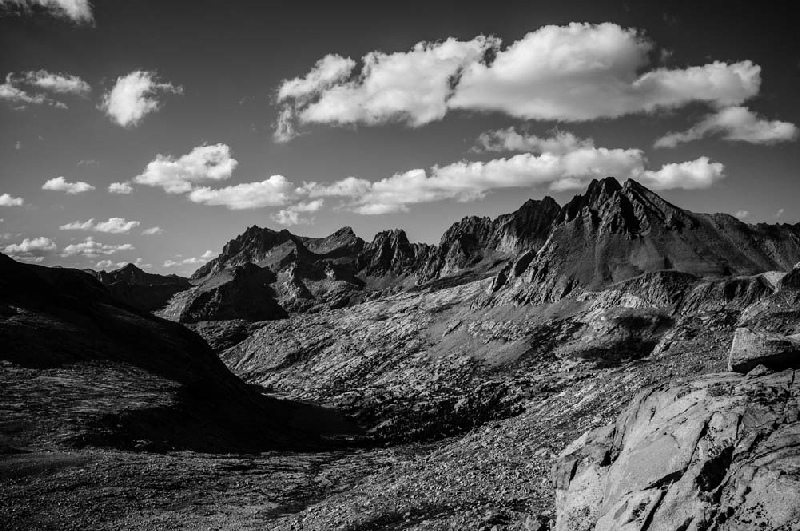 At the trail junction, the JMT branched left to the east to ascend the valley in the direction of the Mather Pass. After Deer Meadow, the zig-zag path of the Golden Staircase was climbed to a high shelf and the two Palisade Lakes. We lunched at the lower lake and a good and refreshing swim was had here. 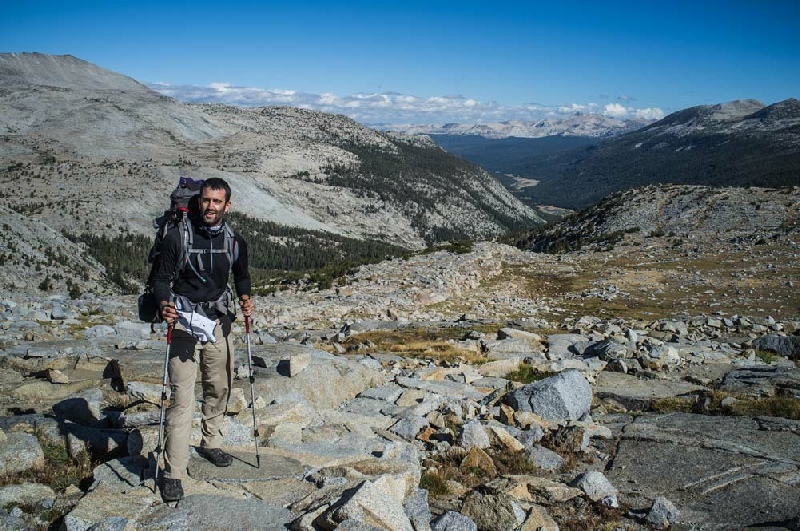 The terrain became more rocky and barren as the path wound its way to the top of the Mather Pass at 12,100ft. The landscape to the south looked even dryer and austere as the path zig-zagged down from the Pass. We finally stopped at about 6:30 so as to make camp about 4 miles from Bench Lake. After a good night, eventually the tree-line was reached and the Kings River followed for some time. The Pinchot Pass at 12,130ft was climbed without any great difficulty and again there was a wonderful alpine vista waiting beyond the pass to behold. A long descent followed to a most impressive suspension bridge. The bridge had a very unnerving resonance when crossed and we were glad to get to the other side without being catapulted into the water below. A hard approach walk followed up a wonderful valley towards our campsite at Dollar Lake. 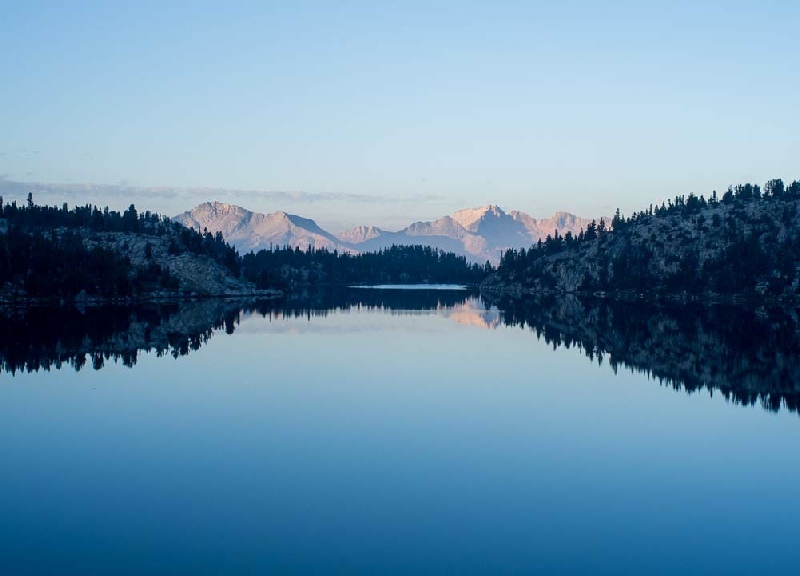 Arrowhead Lakes were passed early in the morning to finally reach the most wonderful spot on the whole of the JMT - Rae Lakes. With wonderful beaches and crystal clear water, overlooked by the great arch of Fin Dome peak, this truly was a magical spot. A great swim was had in one of the lakes on our way through to Glen Pass at 11,9778ft. The view back from the pass across to Rae Lakes was truly memorable. The gradient was easy at all times using the well engineered path but we were still glad to reach the top. A steep descent of over 2000ft followed to eventually arrive at Vidette Meadow. 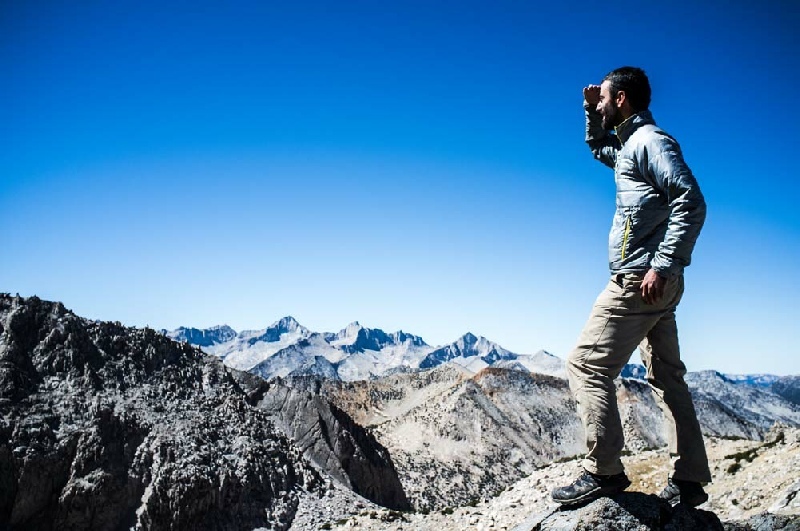 The next objective was the highest pass of the JMT, the Forester Pass standing at a monster 13,200ft. As the path climbed, the scenery changed from forest to an incredibly bleak rocky moonscape with no vegetation. There was not enough time to complete the climb in the day so we set up camp at the tree-line in a good position to finish the climb to the top of the pass early the next day. 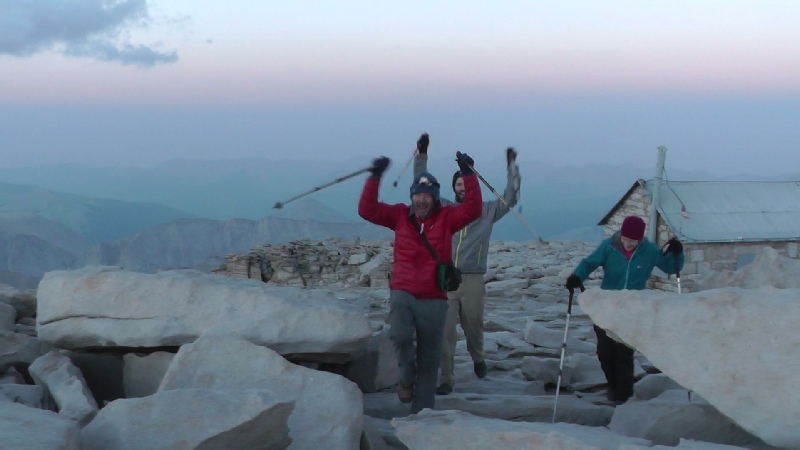 The ascent of the Forester Pass was accomplished early in the morning without too much pain. After taking plenty of photographs, there now followed the incredibly steep, engineered descent down the almost vertical face of the mountain. The rest of the day was a relatively gently walk to Guitar Lake, nestled under the final destination of the John Muir Trail, Mount Whitney summit. A fine mix of woods and meadows kept up the interest levels. A memorable sign was passed on the way indicating 8.3 miles to the top of Mount Whitney. The number of trekkers passed was increasing all the time as we got nearer to Mount Whitney with summiteers returning from their successful expeditions. Finally Guitar Lake was reached and the last camp of the JMT was set up followed by a very wonderful sunset. The climb started at about 3:00 in the morning with a quick ascent to reach Trail Junction. At this point the rucksacks were left and the final 1000ft of climbing was accomplished with a great feeling of lightness. The summit was reached just as the sun was appearing through a layer of cloud - a magical moment. The views from the top were astonishing particularly looking off into the north where we had come from on the days before. After signing the summiteers book we started our descent. And what a descent with 2000ft of switch backs before the gradient lessened somewhat for the remaining descent to the final destination, the cafe at Whitney Portal. The trail was complete with again some truly wonderful memorable times. The practicalities of getting back to San Francisco then loomed large in our thoughts but we need not have worried since a lift was gratefully accepted to Lone Pine and where after a night in a motel we boarded a bus bound for Reno Airport to pick up a hire car.